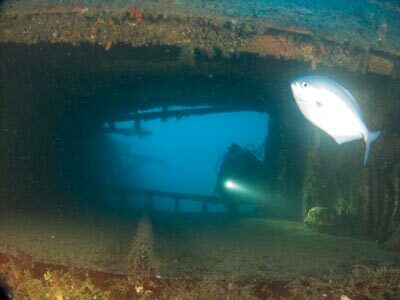 "The Wanderers at 43 m is Sydney's deepest reef dive"
From 1962 to 1969 nine new Conrad Class oceanographic ships were built for the US Navy. The new ships were all named after noted oceanographers. On 15 June 1961 the hull was laid down at the Christy Corporation shipyard at Sturgeon Bay, North East Wisconsin, USA, for a ship that was to be later launched as USNS Charles H. Davis. The new vessel was 63.7 metres long (58.4 metres waterline) and 11.4 metres wide. The new ship was launched on 30 June 1962. It displaced 1,380 tonnes full load. The ship was powered by a 10,000 shp diesel electric engine (a diesel engine running generators that powers an electric engine that drives the prop). There was also a 620 shp gas turbine engine in the funnel and there was a 175 hp bow thruster. It has been said that this motor was used for silent running when doing "spy duties". The Charles H. Davis (AGOR5) was named after Charles Henry Davis (16 January 1807 to 18 February 1877), a Rear Admiral in the United States Navy, who served primarily during the American Civil War and with the United States Coast Survey. The ship was delivered to the US Navy on 25 January 1963. It was operated for the Naval Oceanographic Office by the Military Sea Transportation Service which was later called Military Sealift Command. These ships are crewed by civilians. It has been rumoured the ship was actually used by the CIA or similar organisation for spying on Russian vessels, hence the engine in the funnel and the "bow thruster". The bow thruster (called a retractable azmuthing bow thruster) actually dropped out of a hatch in the hull's keel and appears may have worked like an outboard motor. The ship was crewed by 23 civilian mariners and 38 scientists. Its role was to perform acoustic experiments on sound transmission underwater and for sea floor studies. 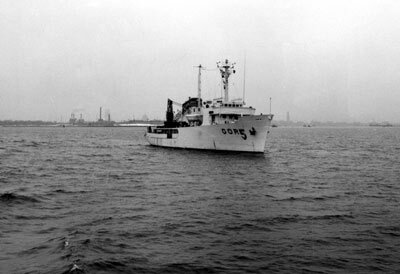 The history of the ship is a bit scant, I have no only information at all about her time as USNS Charles H Davis. It would appear that she did not actually serve for a long time, perhaps as little as two or three years. She was laid up for some time, perhaps a couple of years, from the late or even mid-1960s and then offered to New Zealand. She was originally offered as a loan for five years starting from 28 July 1970. This was extended for an additional five years and in 1979 she was leased for 15 years to New Zealand. 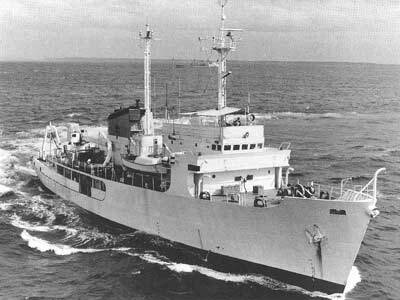 On 10 September 1970 after a partial refit, the USNS Charles H Davis was commissioned as HMNZS Tui at Brooklyn, New York. 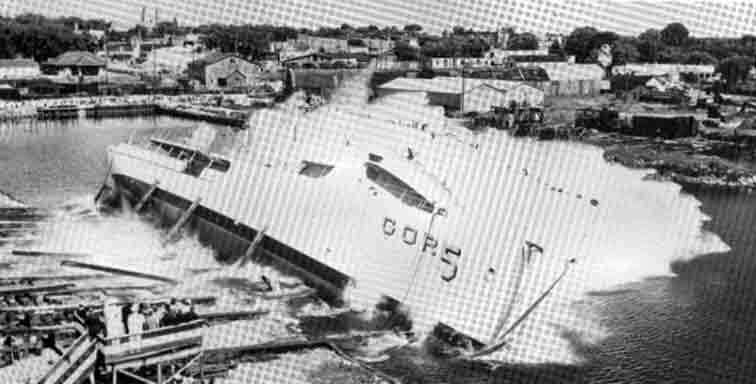 Later that day while being moved, she was struck on the stern and damaged slightly by the tug Michael Moran. The next day a formal commissioning and handover ceremony was held. Some sea trials were held off New York over the next few weeks and on 24 September 1970, HMNZS Tui sailed for New Zealand via Panama Canal and Tahiti. She arrived in Wellington on 7 November 1970 and Auckland on 13 November 1970. The refit appears to have lasted about three or four months and on 10 March 1971 the Tui started sea trials. In April 1971 she started work for the Defence Scientific Establishment at Auckland. A lot of scientific equipment had been added. From this time on she did work around New Zealand and further afield in various Pacific Island countries, sometimes in conjunction with Australian ships. As suspected, most of her work has been to do with tracking submarines. At some time, perhaps during the 1971 refit, cable laying gear was installed at the stern. In 1973 she underwent a 12 week refit when a new main engine was installed. During 1975 to 1977 new scientific equipment was installed and some navigational and auxiliary machinery replaced. In July 1978 the Tui was sent to Raoul Island in the Kermadec Islands (over 800 kilometres north of the North Island of New Zealand) to bring back to Auckland some men who were stranded there when their boat the Picton was wrecked there on 20 July 1978. During this action, the Tui's tender capsized while transferring the men from the shore to the ship. After the lease of the Tui was extended in 1979 for 15 years, a major refit was carried out over 1979 and 1980. On 12 February 1981 the main diesel generator (not sure if it was the engine or the generator itself) on the Tui failed while in the South Taranaki Bight. The bow thruster engine was not strong enough to enable her to make progress to port. She had to be towed back to Port Taranaki by the Maui ship Austral Tide. Temporary repairs were made and on 17 February 1981 she went back to Auckland escorted by the frigate HMNZS Taranaki. Another refit was carried out and February and March 1983 at Lyttelton. This was the first such work done to a large NZ Navy ship away from the Navy's own yard at Devonport, Auckland since World War II. In the mid and late 1980s, the Tui was sent to Mururoa Atoll, a French territory in the South Pacific Ocean, where the French were exploding nuclear bombs (notice how they did not do this in the Mediterranean!). 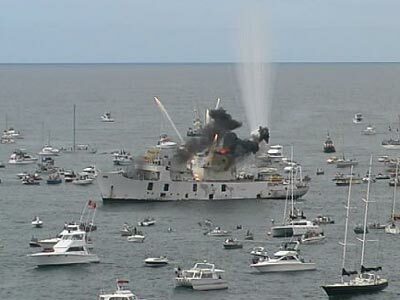 In 1997 HMNZS Tui was decommissioned and on 20 February 1999 she was scuttled as a dive site just north of Tutukaka on the North Island of New Zealand. She was supposed to have been sunk about two kilometres south of where she ended up but the people living nearby objected (they reckoned the wreck would end up on their beach!) and it had to be sunk further north in a spot that was not as good as the selected one (eg rocky bottom compared to preferred sandy bottom). 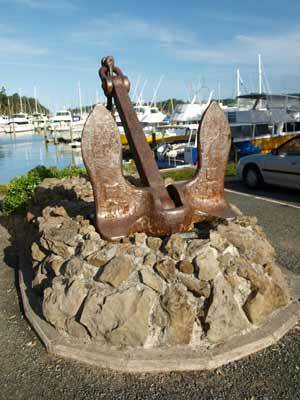 One of the anchors was given to the city of Napier and it is now on display there on the beach front. 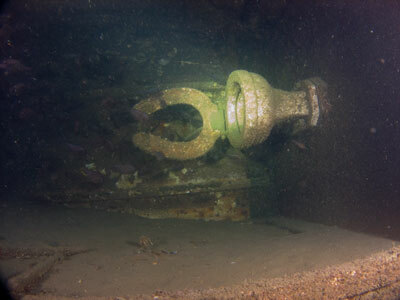 On 12 February 2009, the Royal New Zealand Navy recovered the remaining anchor from the wreck. This was presented to Tutukaka and is now on display on the right hand side as you approach the marina. Today, the wreck of HMNZS Tui lies at about 33 metres just over four kilometres north of the entrance to Tutukaka Harbour. 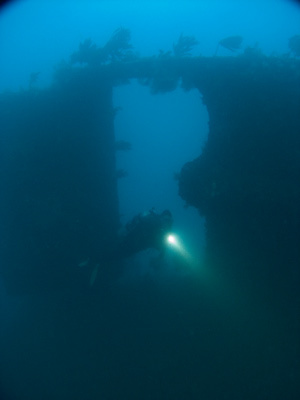 The wreck sits on a bottom composed of sand and rocky reef. The wreck's location is north of the headland called North Gable. GPS Reading of S35° 34' 56.6" E174° 32' 33.4" will put you on the wreck. There is a mooring here, attached to the bow (I think there is another one as well). 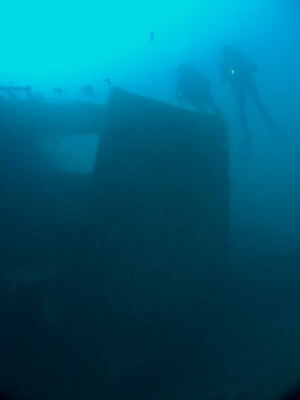 The wreck lies roughly north-south, with the bow facing north. The first think you will notice when you reach the wreck is that it is not upright. It lies on its port side (mostly - see later) and is also quite broken up. There are five large sections of wreckage. The first is the bow section, then the main amidships section and behind this the stern section. The stern is actually almost upsidedown now, with a slight list to the east. There are also two other sections to the west of the main wreckage, the funnel and what appears to be the bridge area. It is about 27 metres deep at the mooring on the bow. 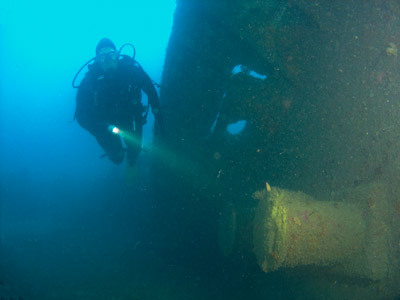 From the mooring on the bow, head to the south and cross over the gap between this section and the main section of wreck. Keep going and then cross over to the stern section. As mentioned, this is almost totally upsidedown. As such, the prop shaft and rudder are clearly visible. The rudder makes a good photographic background. From here, head back to the north to the break between the two parts of the wreck. Head to the west and you will swim across a section of reef/sand about 20 metres long and the encounter the two remain parts of the wreck. These are the funnel, which is lying to the south of the other section. This other part appears to me (on the quick look on my only dive) to be the upper part of the bridge. A quick look around here and it will be time to go back to the main part of the wreck. In the western part of this section you can enter and see a bathroom, with hand basin and a toilet. From here, head forward to the bow and you can see the upturned bow, with bollards clearly visibly on the deck itself. You will only get about 17 minutes on the bottom before you run into decompression. We did 23 minutes and had to do five minutes of deco at three metres. 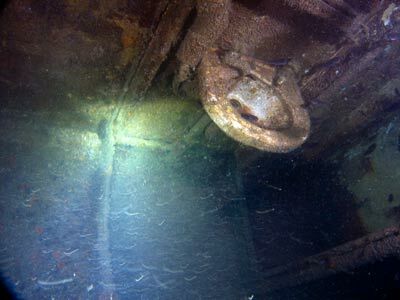 As this is a relatively large wreck (for example, it is at least 12 metres longer than the colliers sunk off Sydney) and relatively deep at over 30 metres, you will need multiple dives to really explore the wreck. Visibility when we dived it was only about 10 metres and in spots a bit worse. The water temperature was 22°C in March. 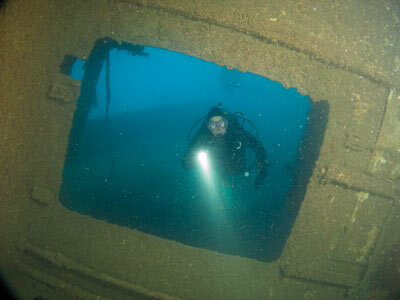 This is a nice wreck, but I would only dive the Tui if you are a New Zealander and can visit the Tutukaka/Poor Knights area regularly or if you are doing at least 10 dives in the area. Return to the Tutukaka/Poor Knights menu.